The present case has been reported in the Journal of Respiratory Medicine Case Reports. A 51-year-old obese male (BMI 58) was referred to the pulmonary clinic for progressive shortness of breath on exertion for one year prior to presentation. He is a lifelong non-smoker and has a past medical history of diabetes, hypertension and obstructive sleep apnea. He has no history of occupational/environmental exposures or recent travel. He also reported occasional dysphagia to solid foods. Physical examination was significant for obesity and a normal heart and lung exam. Routine blood tests were unremarkable. His CXR showed prominent mediastinum but clear lungs. An office pulmonary function test showed normal spirometry, lung volumes and diffusion capacity. He had a transthoracic echocardiogram and was found to have a normal ejection fraction and right ventricular systolic pressure. 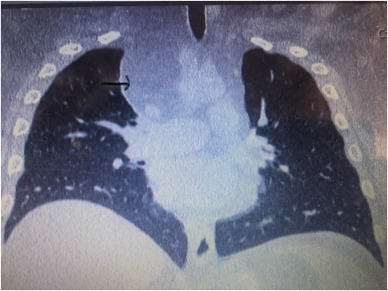 A non-contrast CT of the chest was obtained which showed a large oval shaped fat density, not sharply demarcated measuring approximately 5 cm transverse by 19 cm craniocaudal extending from the lower right neck into the right anterior mediastinum. This displaced the innominate vein anteriorly, the brachiocephalic artery laterally to the left and the superior vena cava anteriorly. Lung parenchyma was essentially preserved. The mass had the consistency of fatty tissue suggesting lipoma. 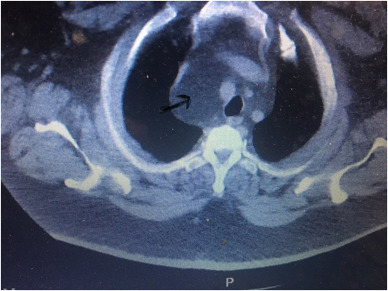 The patient underwent an endobronchial ultrasound guided transbronchial aspiration (EBUS-TBNA) of the mediastinal mass which confirmed a benign lipoma. He is currently undergoing pre-operative work up for resection of the lipoma.